I'm going to be heading out to San Jose ('do you know the way?') next week with Julie Myers to work on some workshops with her, as part of Zero 1 festival. The Almanac project involved collecting time lapse photography from 5 sites, over the course of a year. These images are used to generate 1 minute video sequence that is shown each day on the main screen at Cinema City in Norwich. The video sequence is specific to the current date, and the site displayed is picked at random from the selection available. This project has been going on for 4.5 years, and is now finally installed and running in the cinema. 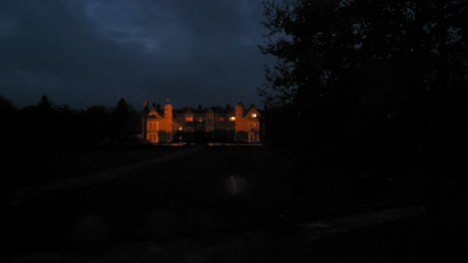 The project was initially commissioned solely for presentation for the cinema, but we have added a web presence for the videos at http://www.somewhere.org.uk/almanacfilms where each days film is posted after it has been generated for the cinema. You can find out more information on the background to the project on the main Almanac site on somewhere's website. I've been involved since the early stages of the project in advising on how to manage the collection, recording and storage of images, creating test versions and finally building the end database and software to generate the video clips which are displayed in the cinema, and to dynamically create and upload versions to the project website. 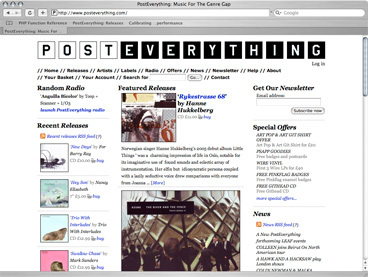 I've just put up a new version ofPostEverything, after 6 years. It's been a long haul, and really this should have been there many years ago, but hey ho, I've been busy elsehwere. Anyway, it's here now, and I hope a lot better than the previous site. And a lot more adaptable, which is the main thing. What's there is fulfilling the basic requirements of the site - physical and downloadable music sales - needed for relaunch, but there is much more to come. And no, it's not turned into a social networking site. As Chas'N'Dave Say: Rabbit, rabbit, rabbit, rabbit! 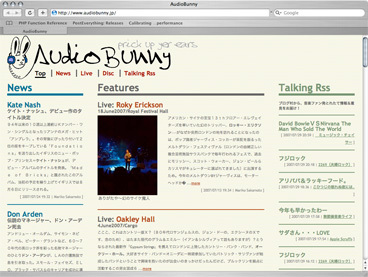 AudioBunny was soft launched about 8 weeks ago, and is gradually gaining a reputation in Japan for it's no-nonsense editorial style. The intent is to provide an alternative to the payola basis of the content in music magazines in Japan, using web publishing to open up the platform for music writers to write what they want to, and for a broader coverage of music available in Japan outside of the established monopolies. 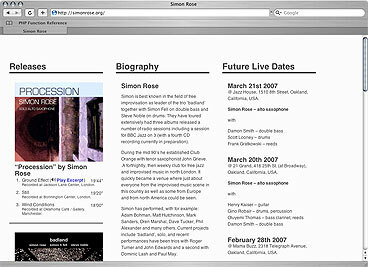 This is a very compact site - 1 and a contact page in fact - that I made for Saxophonist Simon Rose. I started with the aim of building a small CMS driven site for him, but in the end put everything on to one, very minimal, page. It's still powered by the CMS though. I'll be adding the ubiquitous blog to it sometime soon. That'll make it all a bit larger. 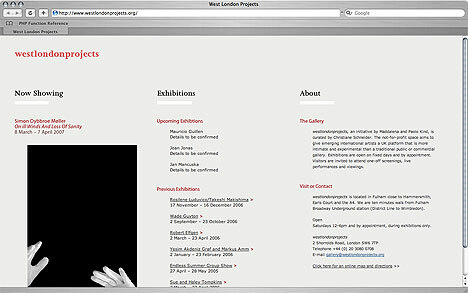 I've just put an amended and extended design by Paul Hetherington onto West London Projects, once again backed by my CMS, to make it all nice and easy for someone other than me to keep up to date. Darwin Streaming Server and AwStats. How to analyse QTSS and MP3 log files ... and other boring anecdotes. This is a techy entry just so I can refer to it in the future, or may save some other soul the time of wondering. LogType=S LogFormat="%host %uaquot %time1 %methodurl %code %bytesd %extraX"
This is all pretty easy to work out, but if you like the lazyweb this might help. To stop Darwing Streaming Server from rotating the log files I've set the rotate on log-size and log-age parameters to 0, and it seems to work. Now I just need to work out a better way of rotating the logs in sync with creating the stats. I've been working on this one for a while - my appologies to Grizedale, but it's now live in it's first phase, and will be ramping up soon. Elsewhere In Between is a project developed by Julie Myers which I helped her in the latter stages of, building a primitive video sequencer in Flash that uses a database of video clips to allow the user to make their own journey through the eyes of five film-makers in five countries. The composer was originally developed by Julie in conjunction with BT's R&D facility with the intention of making an interactive DVD. At a late stage in the project it became apparent that a DVD would not be able to do what was desired. This interface was built over 4 days to be given out on DVD to delegates to a conference organised by FACT, and used in a kiosk installations as well. Because it was built in Flash it was relatively trivial to create lower bandwidth video clips that could be played over the internet.